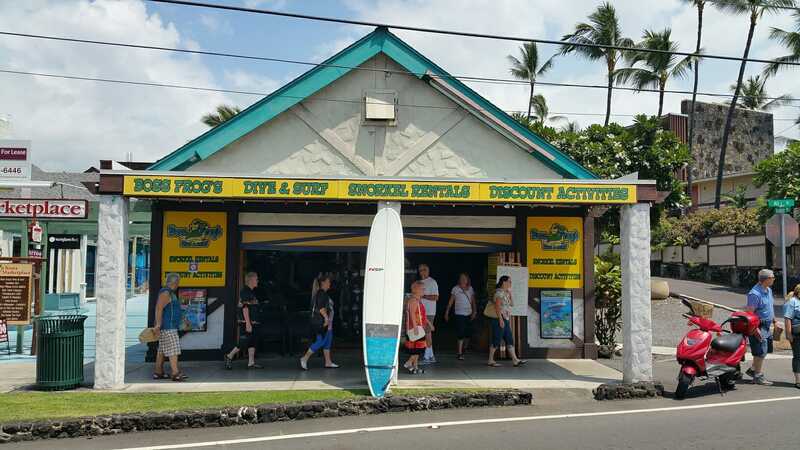 Driving Directions: Boss Frog’s Kailua-Kona Snorkel and Dive Shop is located on Alii Drive in the heart of Kona Town, across from the Kona Inn at the Kona Marketplace. Our Kailua-Kona location has just about everything you need for your Hawaii vacation. If you are looking for snorkel or beach rental gear, we have it all from boogie boards to full professional Kailua-Kona snorkel rentals. If you are planning to attend a luau, take a helicopter tour, do a snorkel cruise or pretty much any other Hawaii activity imaginable, our agents can book it for you right on the spot. Need an extra pair of swim trunks, some sunscreen, hula dolls, or extra towels? We sell all those things and more! If we don’t have it, one of our helpful agents will be glad to point you in the right direction. Don’t forget to get your free driving and snorkel maps and pick up brochures for any Big Island activities you may want to experience. Make sure to grab your discount Kailua-Kona snorkel rentals for your next ocean adventure, too!